Bryson DeChambeau has won four times in his last nine starts. 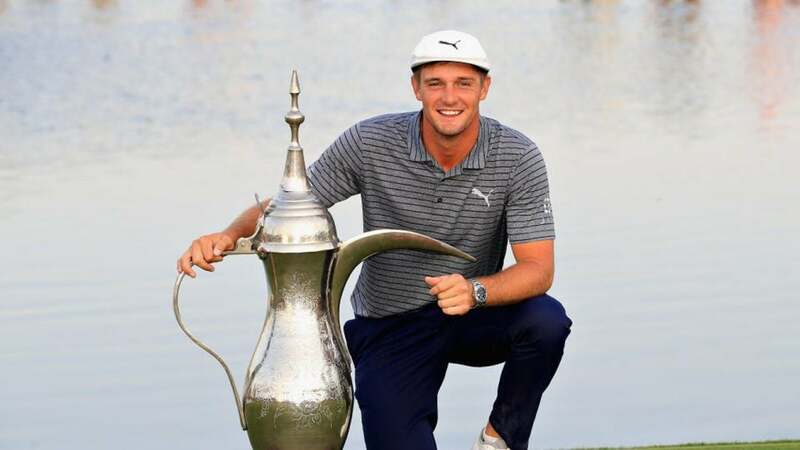 Bryson DeChambeau shot a tournament record 24-under 264 to win the Omega Dubai Desert Classic by seven strokes this weekend at Emirates Golf Club. DeChambeau, who shot an 8-under 64 during Sunday's final round, has now won four times in his last nine starts. Ranked No. 5 in the world, DeChambeau had shot a pair of 6-under 66's and a 4-under 68 before Sunday's final round. Despite sitting at 16-under 200 through 54 holes, DeChambeau's best golf in Dubai had yet to come. His final round score of 8-under 64 consisted of seven birdies, one eagle, and one bogey. DeChambeau opened up his final round with three consecutive birdies before settling for par on the next six holes. Then, the 25-year-old DeChambeau finished with an eagle and birdie at the 10th and 11th holes following the turn for the back nine. However, his strong play was brought to a brief halt when he bogeyed at the 12th hole. But he quickly bounced back with a pair of back-to-back birdies at 13 and 14 before scoring his seventh and final birdie of the day at 17. https://twitter.com/EuropeanTour/status/1089478397313441792 "I think it's fantastic obviously," DeChambeau said after his final round. "It's great that anybody can tell you that you've done something good. I think it's a little bit vindicating that I'm able to come out and have success like this on multiple tours. I'm very proud and happy and thankful as well." The previous tournament record had been set at last year's event by Haotong Li, who shot 23-under to win. But this was Bryson's weekend to dominate, as he finished in the top five in Strokes Gained for driving, long game, approach play, and putting. In his last nine starts, DeChambeau has not finished outside of the top-20. His most recent victory came this past November at the Shriners Hospitals for Children Open in Las Vegas. He now has seven professional wins after his first on the European Tour.